The ubiquitous English bread appears to be a toast loaf. 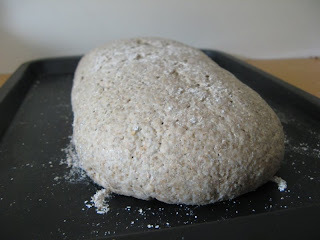 It has some amazing characteristics: it will last for weeks without the slightest mold; it never loses its spongy texture; it contains no fibre, despite supposedly being prepared from flour made from happy wheat; it will never fill you up and the flavour is as bleak as a gray winter morning. I suspect it is part of the predictability that reigned over palates here. It is finally beginning to change, with more variety, fibre and colour making an appearance in stores. But there is a long way to go still. When I found rye flour in the supermarket, I bought it. I'd never worked with rye before, although I'm a great fan, so a long period of "experimentation" (aka unexpected bread) followed. My first attempt was dense, had to be baked for more than an hour to be almost done and had a bulletproof crust. 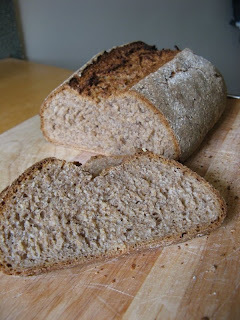 The successive attempts increased the amount of wheat flour, but the results were still far from spectacular. Most of them just sat there, not breathing, not moving, stoically rejecting every form of encouragement I could think of. So read some more. What the dough should look like, how it should behave. Baker's Percentage. Hydration. Learned about shaping loaves. Steam. I think my sense for what will be bread is slowly developing, but the wonder and awe are still there, on every loaf. The time came to do rye again. And this time, it worked. Beautifully. The secret? Stretch the gluten, then give it time. After a few minutes it will change from just being soft and mushy to having texture. It will start to come together, feel smooth in your hand. Knead some more. I usually keep going for 5 minutes - my work surface becomes uncomfortably low if I knead any longer. Gently press the dough down, then fold in the edges bit by bit, turning the dough as you go. This should give you a jellyfish-like mound, turn it over so the smooth side faces up. Place your open palms on either side of the round, move one up and one down to twist it into an oblong shape. Apparently, this helps to get a smooth rise. When it is airy and bubbly, turn it out and gently press it flat. Roll/fold/stretch into a snake, press down again. Now fold in a third of your flat snake from the one end towards the middle, the same with the other end. Press down slightly, then roll it up, as tightly as you can, stretching the dough as you go. Roll a bit to get a smooth oblong shape. I then flour my bread, cover, and let it prove. Watch it prove. It might take 30min, or 3 hours, depending one a myriad variables. When it has almost doubled in size, and it feels light and puffy to the touch, the loaf is ready. (It is a loaf now, not dough.) If you're wondering about the incredible amount of detail in kneading, folding and shaping - it's all about stretching the gluten. With the right tension, your bread will behave as expected: rising evenly, gaping along gashes, etc. I bake in a preheated oven (240C), usually with a bowl of boiling water at the bottom of the oven for extra moisture. Just before the loaf goes in, I make a smooth cut along its length, to give some room for expansion. Then bake for 30min, turning the temperature down to 200C after the first 10 minutes. It's done when the bottom sounds hollow when tapped. My loaf didn't rise up as much as it expanded sideways, but it was beautiful nonetheless. 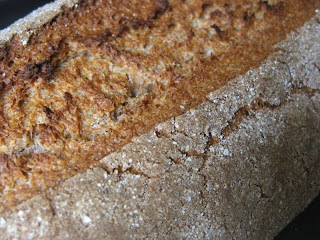 It has a fine crumb, is actually quite light, yet filling with a strong nutty flavour I get very excited about. This bread will be a regular. die brood en die bakker is beide uiters hot. That bread is very beautiful. Thank you for the inspiration. I haven't baked proper bread forever.